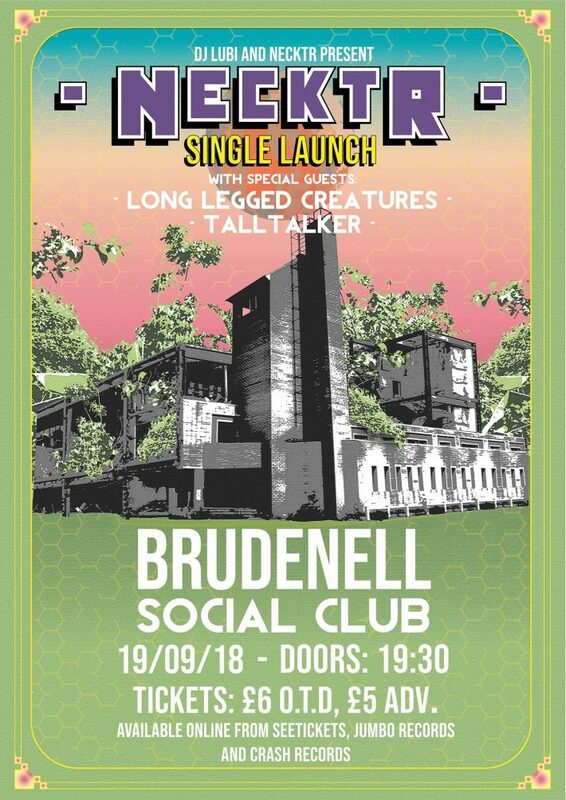 After a year and a half of relentless gigging, the acclaimed Leeds based nine piece, Necktr, will return to the Brudenell Social Club on the 19th of September in conjunction with their long time friend and fellow collaborator, DJ Lubi. Having made a name for themselves locally through a wealth of gigs and projects with other bands, visual artists and collectives alike, the nonet have been expanding their progressive take on soul, hip-hop, jazz and afrobeat around the country. After completing a number of summer tour dates including festival appearances at Brainchild, El Dorado, and Tramlines Festival, Necktr now embark on completing another round of tour dates that will include a variety of northern and southern shows across Autumn, with their Brudenell date set to be one of their most memorable shows. Long Legged Creatures have been evolving in their Leeds basement for two years, and are now creeping out with their twisted live electronica. Consisting of Ed Allen, Beth O’Lenahan and Matt Hill, their taste for wonky harmony, heavy grooves, and creating a sense of unease, shows their mixed influences. Now live producer, Ross Wilson has entered the fold with his driving electronic dance music, to blend the recklessness with a nod to the deeper UK dance sound. Tall Talker have been on the Leeds scene for a while now, blowing peoples mind’s left, right and centre with their unique stance on fusing math-rock, jazz and funk. With their debut ep set to be released very soon, these guys’ lush harmonic sensibilities and intricate metric meanderings will get you up off your feet.